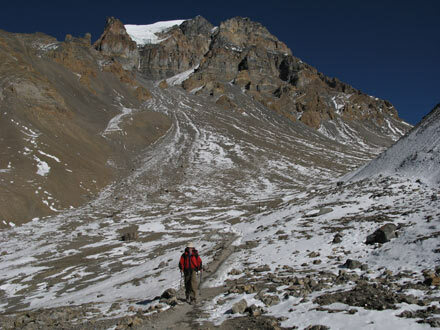 Hiking the Annapurna Circuit, there seems to be a disproportional focus on crossing Thorung La Pass. Everything is either before the pass or after the pass. 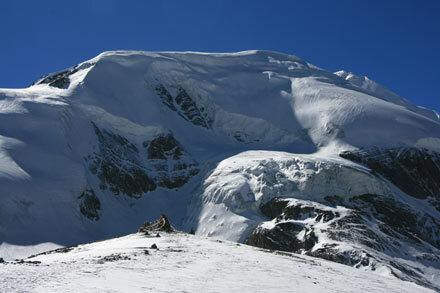 At an altitude of 5416 m (17,768 feet), Thorung La Pass is a couple of hundred meters lower than Drolma La Pass at Mt. Kailash, and yet, acute mountain sickness (AMS) is much more of a topic here than it ever was in Tibet. There is even a daily lecture on how to prevent AMS in Manang, a small village where we spent a couple of days acclimatizing. Because of all the endless stories of people getting sick and having to turn back, we couldn’t help but feel apprehensive ourselves. All the tension intensified when a French tourist crossing the pass died (I know a similar thing happened at Mt. Kailash, but no, we’re not making this up). Between Manang and Thorung La Pass, we spent a couple of nights in Yak Kharka (4020 m / 13,185 feet) and Thorung Phedi (4560 m / 15,040 feet) walking only 8-9 kilometers (6 miles) a day but steadily gaining in altitude. While the Manang valley was green and forested, the higher regions of the circuit were soon dominated by multi-colored earth tones and rocky terrain. When we finally got to Thorung Phedi, from where the steep climb to Thorung La Pass begins, we were in the cold, barren Himalayan wilderness. We started our hike just after 6 AM the next morning, two hours later than most people who had left in the darkness with only a headlamp. Although a long day lay ahead of us, we decided it was safer to leave after sunrise. Even with the sun coming up, it was freezing cold and by the time we got to Thorung High Camp one hour later, the water in our bottles had turned into a slushie. The beautiful views of Annapurna 3, Gangapurna and Chulu West lured us to sit in the warm teahouse and enjoy the sight but we pushed on over an intimidating-looking ice-covered narrow path. The temperature seemed to change constantly now depending on whether we were walking in a sunny or in a shaded area. 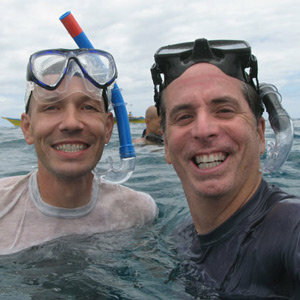 Jackets off, jackets on – we were hot one moment and cold another. Tony and I continued winding our way slowly up toward the pass over snow-covered trails. While we were showing the first signs of fatigue, the sight of the beautiful Thorung Peak inspired us to keep going. We arrived at Thorung La Pass, a broad saddle between the Yakwakang and Khatung Kang mountains and marked by prayer flags and a stupa, just after noon. We had climbed 800 m (2,600 feet) in 5.2 km (3.2 miles) since we left the lodge but 9 more kilometers (5.6 miles) and a descent of 1700 m (5,500 feet) lay beyond the pass. This is the reason why the Annapurna Circuit is usually done in a counter-clockwise fashion starting in Besisahar and finishing in Birethanti. Who would want to climb 1700 m in one go at those altitudes? We spent 30 minutes on the pass before moving on to avoid the full blow of a lurking headache. As we started down the steep trails, the landscape transformed once again and the Dhaulagiri mountain range and ash-brown hills of Mustang came into view. Because we were running late and did not want to overnight on the frigid mountain, we sprinted down the zigzags whenever we didn’t have to skid over icy ledges or walk through deep snow. Our knees were in desperate need of rest when the trails suddenly leveled out and led us through a valley right into Muktinath just as it was getting dark. We were completely drained but happy to have successfully completed this pivotal and most difficult leg of the Annapurna Circuit. One thing I have noticed in the pictures: although you are hiking at a very high elevation, above the 5,000 mts line, the amount of snow that shows in the pics is small. Considering that you are there in the dead of the winter, I can only assume that that’s the effect of global warming. I’d be interested to hear fvrom you about this. 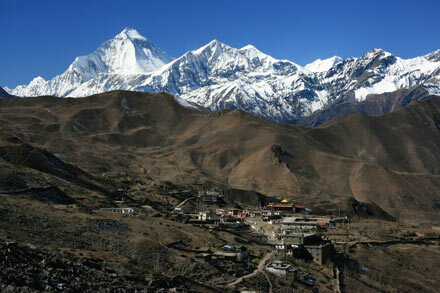 Nepalese are telling us that the weather has been very strange this year – everyone here’s taking about climate change. The monsoon seemed to last much longer this year. Although the main trekking season is in October and November with supposedly clear skies, the rain clouds covered most of the mountains during that time. What size pack did you use and or what would you recommend taking on this trek if you were to do it again? I would take as little as possible. If you are tea house trekking, you really don’t need much: appropriate clothes (not to much), a good down sleeping bag, and lots of snack food. We both had larger bags, but they were only about a third full. We carried tons of trail mix, candy bars, dried fruit etc. because such snacks are quite expensive at higher elevations. It’s also good because your pack gets lighter as you hike. We also carried Katadyn water filter to cut down on water costs, although we already had that so it wasn’t an additional investment. If you are only going to use it on this trip, buying a Katadyn wouldn’t make sense. How can you follow the trail? there is some signal to guide you? thank for your answer. 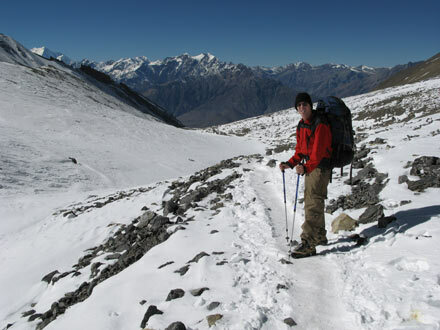 I am thinking to do it in Febrary and I was thinking not to take a guide is the trail is well indicated. Do you know how many centimeters more ore less? Do you know if we will need snowshows or campron? Do you recommend to have a guide for that season? 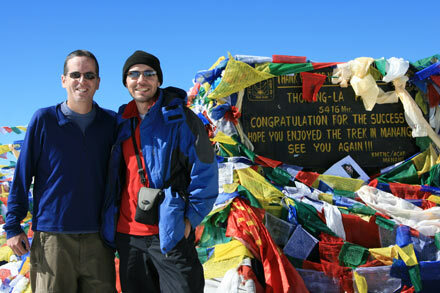 My information is a bit old because we did this trek in 2007. But when we were there, I think they actually closed the pass during periods of heavier snow. Of course, the snow fall varies, so I really couldn’t give an estimate. When we were there in mid-November, there was already up to 30 cm of snow in parts, and portions of the path were already somewhat risky and hard to follow. If there is serious snowfall and the pass remains open, I would definitely recommend a guide over the pass. It’s not a hard route, but it’s a long stretch and you don’t have time to keep trying to locate the path. Another thought as well, if there is heavy snow, the higher lodges near the pass might be closed for practical reasons, which means you might have to start from a lower lodge. That would extend the length of the crossing. Make sure you listen to any local warnings about path conditions and snow conditions. Don’t ignore good local advice. 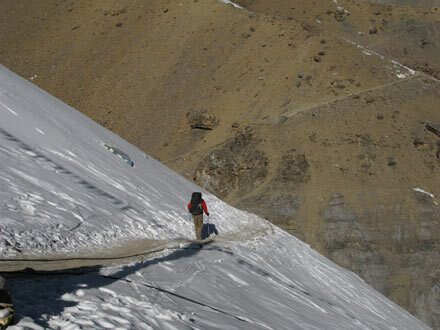 People die on these routes, even if they are commonly hiked. Two people died on Thorung La Pass just while we were doing the Annapurna Circuit. You know what, I’m going to post your question on our Facebook fanpage and see if I can get any more updated info on this for you. Hey Maria, here are the responses I got off our Facebook when I asked the question. Several of the people are in Nepal right now. Brian Laguardia: I believe that particular pass is month to month – and it would need to be checked during the time – but more generally I would think February would be one of the least favorable months to try it due to weather. However, I would defer to experts Ram Barakoti, Basu Panday, and Raj Tamang. Any thoughts on the above guys? Дима Шатров: As far as I know it is a bit late to go there. Nakul Devkota , my friend, what do you think? Dear Dima my friend. I am sure the high passes during February would be more challenges due to un expected snow fall. 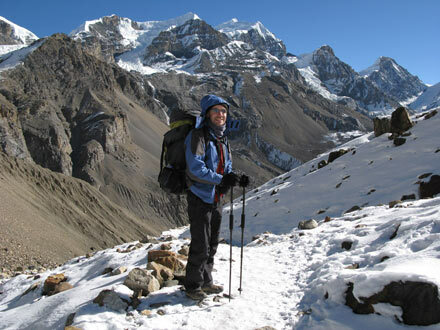 But in my experience those who love mountain like Annapurna or any other Himalayan ranges they want to try to achieve their goal which they have dreamt about. So, the conclusion is February is not trekking season but if anybody want to try, I can say please if you dare it then do it. I am sure Dima he or she will make it. Do you know if there is some place in Katmandu where I can have some information about situation on the pass and if there is snow on the pass when I will arrive in Katmandu on February?